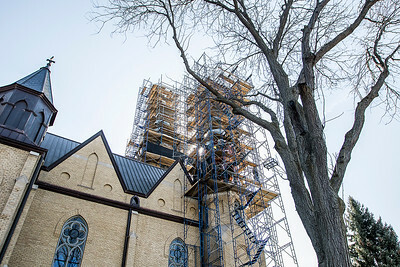 Sarah Nader- snader@shawmedia.com The large steeples are under construction to put on a new roof at St. John the Baptist Catholic Church in Johnsburg Friday, April 17, 2015. 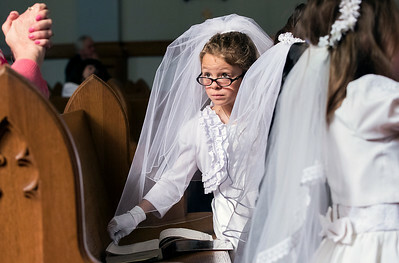 Sarah Nader- snader@shawmedia.com Second-grader Kaitlyn Remke, 8, of Johnsburg flips through the Bible before receiving her first communion during school mass at St. John the Baptist Catholic Church in Johnsburg Friday, April 17, 2015. Traditionally, girls wear a white dress on their first communion, which is a symbol of purity and a reminder of their Baptism. Sarah Nader- snader@shawmedia.com Alayna Price, 8, of Spring Grove talks with Father Jacek Junak before school mass where she received her first communion at St. John the Baptist Catholic Church in Johnsburg Friday, April 17, 2015. 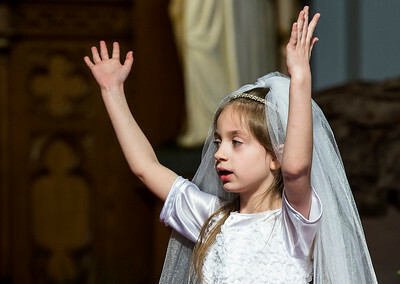 Sarah Nader- snader@shawmedia.com Second-grader Ally Bourne, 8, of McHenry sings a song with her classmates after receiving her first communion during school mass at St. John the Baptist Catholic Church in Johnsburg Friday, April 17, 2015. 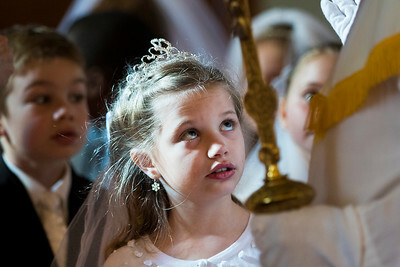 Traditionally, girls wear a white dress on their first communion, which is a symbol of purity and a reminder of their Baptism. 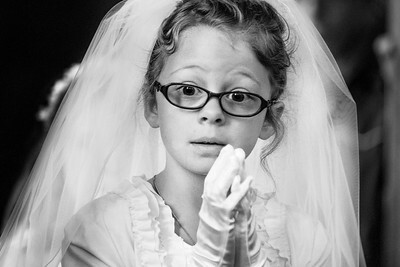 Sarah Nader- snader@shawmedia.com Kaitlyn Remke, 8, of Johnsburg waits before receiving her first communion during school mass at St. John the Baptist Catholic Church in Johnsburg Friday, April 17, 2015. Traditionally, girls wear a white dress on their first communion, which is a symbol of purity and a reminder of their Baptism. 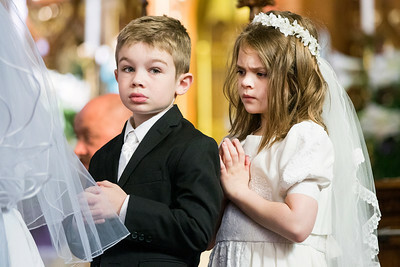 Sarah Nader- snader@shawmedia.com Second-graders Nick Giesinger (left), 8, of Johnsburg and Isabella Pontarelli, 8, of Wonder Lake wait to receive their first communion during school mass at St. John the Baptist Catholic Church in Johnsburg Friday, April 17, 2015. 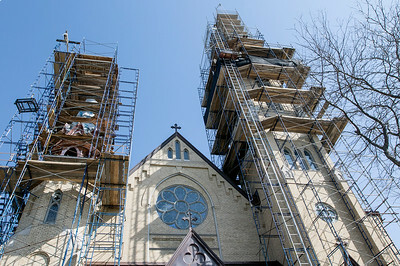 The large steeples are under construction to put on a new roof at St. John the Baptist Catholic Church in Johnsburg Friday, April 17, 2015.